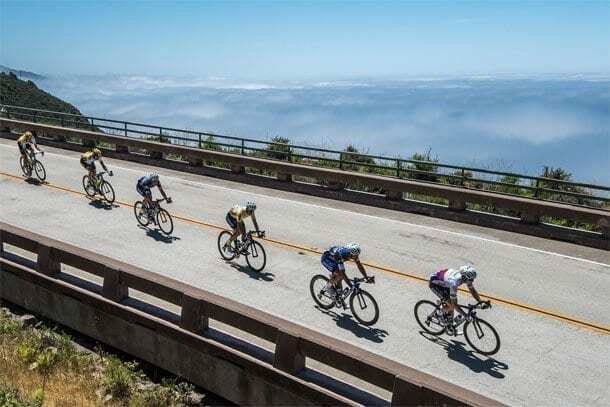 World Champion Peter Sagan (SVK) of Tinkoff has claimed his 15th all-time Amgen Tour of California stage win after a long and hilly ride northward on one of the most scenic and iconic stretches of California roadway, Highway 1, through Monterey County. At 133.6 miles, the 2016 race’s longest stage began in Central Coast’s charming Morro Bay. The peloton of 133 faced undulating hills much of the day with a total of 8,500 feet of climbing during the only south-to-north route along Highway 1 in 11 years of the race. 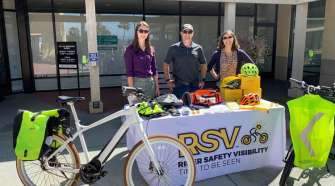 Team Dimension Data for Qhubeka’s Mark Cavendish (GBR), who has nine Amgen Tour of California stage wins to his credit, was among a breakaway that formed about an hour into the race and stuck until a series of climbs toward the stage conclusion in the final miles. The 2011 World Champion was awarded the Breakaway from Cancer® Most Courageous Rider Jersey for his ride out front. Also in the breakaway were Axeon Hagens Berman’s 21 year-old Greg Daniel (Denver, Colo.), who spent his second day in the row riding out front, and Direct Énergie’s Ryan Anderson (CAN). 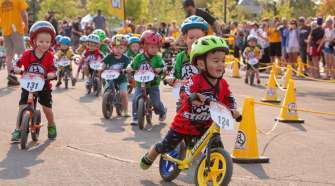 In the last seven miles of the race, the peloton faced two categorized climbs to reach the finish at a destination known worldwide for speed, the Mazda Laguna Seca Raceway. 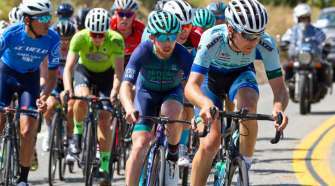 As the cyclists fought it out in the streets, the breakaway was mostly overtaken and the peloton shattered, with attacks coming from all sides as riders vied for position early in the climb. The WorldTour teams worked up front including Etixx – Quick-Step’s Julian Alaphilippe (FRA) to defend his Amgen Race Leader Jersey won yesterday. The last remnants of the breakaway, Anderson drove at the front, with Daniel eventually gaining ground to take a solo first position up the climb with about 3 miles left to ride. Haas attacked on the final climb and led out the sprint to the finish. Sagan summoned his trademark burst of speed to propel him there first. Haas ended the stage in third place, with BMC Racing Team’s Greg Van Avermaet (BEL) swooping in to claim second. Sagan’s performance will put him in the Visit California Sprint Jersey tomorrow, and he is the overall leader for that Points competition as well. The SRAM Best Young Rider Jersey will stay with Neilson Powless (USA) of Axeon Hagens Berman Cycling Team, who turned in another impressive performance on today’s climb, and Rally Cycling’s Evan Huffman (USA) retains the Lexus King of the Mountain (KOM) Jersey. Australian general classification contender Lachlan Morton (Jelly Belly p/b Maxxis) got caught up in a crash at bottom of the climb on Laureles Road. His teammates worked to pace him back, but the setback resulted in a drop from 7th to 37th place overall.